Kirimal is best known for his meticulous research and publications on the history of Crimean Tatars in the first half of the 20th century. He served as the editor of Dergi, one of the publications of the Institute for the Study of the USSR in Munich, and was among the first scholars to explore the fate of ethnic minorities living in the Soviet Union. Edige's father Mustafa Shinkievich, who came from a Lithuanian Tatar (also known as Polish Tatar) family, had moved to Crimea before World War I. He was a descendent of soldiers under the command of the Golden Horde Khan Toktamish who had fled to Lithuania in the late 14th century. Born in Bahçesaray in 1911, Edige received his early education in Dereköy, near Yalta and graduated from the Russian gymnasium in Yalta. He enrolled in the Institute of Pedagogy in Simferopol (now Crimean State University of Engineering and Pedagogy), but his involvement in Crimean Tatar nationalist activities made it impossible for him to remain in Crimea. The Soviet repression, marked by the arrest, execution and deportation of thousands of Tatars, forced him to flee to Azerbaijan and then to Iran. He arrived in Istanbul in 1932. Two years later, he joined his uncle Yakup Shinkievich, who was serving as Muftu of the Lithuanian Muslims in Vilnius, a city then under Polish occupation. Edige graduated from the University of Vilnius with a degree in political science in 1939. Following the invasion of Poland by German forces in September 1939, he left for Berlin and then for Istanbul. During the German occupation of Ukraine and Crimea (1941-44), Kirimal was active in Germany, trying to secure rights and protection for the Crimean Tatars, and later helped refugees from Crimea settle in German camps. After World War II ended, Kirimal pursued graduate studies and received his doctorate degree from the University of Münster in Germany. His often quoted monograph, Der nationale Kampf der Krim-türken (Emsdetten/Westfalen, 1952), was based on his dissertation. He joined the staff of the newly founded Institute for the Study of the USSR (Institut zur Erforschung de UdSSR) in Munich in 1954 and became the editor of Dergi, the Institute's publication in Turkish. Kirimal published numerous articles on the history and nationalist struggle of Crimean Tatars under Russian and Soviet rule. He was fluent in Russian, Turkish, Polish and German. He retired in 1972 when the Institute closed, and died in 1980 in Munich. "The Tragedy of Crimea." Eastern Quarterly 4 (1) (1951): 38-46. Der nationale Kampf der Krimturken. Emsdetten/Westfalen, 1952. "Kirimda Sovyetlerin din Siyaseti" [The Soviet policy on religion in Crimea]. Dergi 1 (1955): 55-67. "1917 ihtilalinden sonra Kirim-Turk ailesiyle kadinin durumu" [The status of Crimean-Turk family and womanhood after the 1917 revolution]. Dergi 3 (1955): 13-30. "The Crimean Turks." In: Genocide in the USSR: Studies in Group Destruction ed. N.K. Deker and A. Lebed. Munich: Institute for the Study of the USSR, 1958, pp. 20-29. "Kirim'da topyekun tehcir ve katliam" [Mass deportations and massacres in Crimea]. Dergi 5 (1956): 1-22. Also in: Emel 15 (1963): 35-40; 16 (1963): 32-40; 18 (1963): 21-25. "Mass deportations and massacres in Crimea." Cultura Turcica 1 (2) (1964): 253-65. "Kirim ve Kirim Turklerinin tarihi gecmisi" [Crimea and the historic past of Crimean Turks]. 45 (1966): 64-71. "Carlik Rusyasi hakimiyeti altinda Kirim" [Crimea under the Tsarist Russian rule]. Dergi 46 (1966): 51-61. "Kirim Turklerinin milli-kurtulus hareketi" [National liberation movement of Crimean Turks]. Dergi 47 (1967): 63-72. "Kirim Turklerinin 1917-1920 ihtilal yillarinda milli kurtulus hareketi" [Crimean Tatar national liberation movement during the revolutionary years of 1917-1920]. Dergi 48 (1967): 55-69. "Sovyet Rusya hakimiyeti altinda Kirim" [Crimea under the Soviet Russian rule]. Dergi 49 (1967): 59-66. "The Crimean Tatars." Studies on the Soviet Union, n.s. 1 (10) (1970): 70-97. "Kirim Turkleri" [Crimean Turks/Tatars]. Dergi 59 (1970): 3-22. "Ismail Bey Gaspirali." Dergi 62 (1970): 60-64. *The biographical sketch of Edige Kirimal was written by Inci Bowman and is based on Mustecip Ulkusal's obituary, "Dr. Edige Mustafa Kirimal'i Kaybettik." EMEL 118 (1980): 1-5. 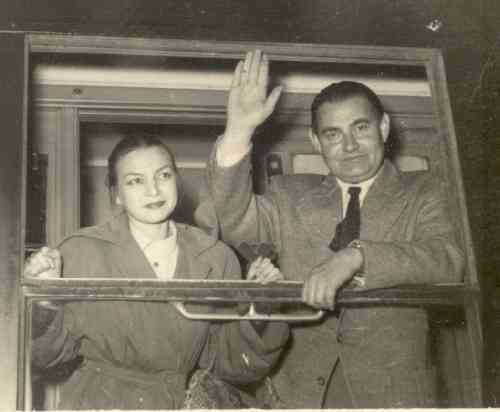 Photograph of Kirimal with his wife Aymelek, 1953: Courtesy of the Ismail Otar Library, Istanbul.